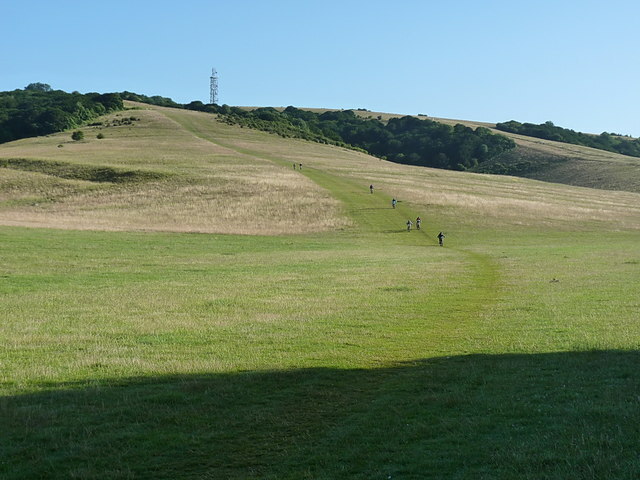 One of the maddest descents on the 2015 British Heart Foundation's ride across the full length of the South Downs Way - you can easily hit 35mph down this field, and probably top 45 if you tried. At least there's plenty of run-out room at the bottom, but you still wouldn't want to get it wrong halfway down at that speed. There are a variety of medieval field boundaries on the hillside, which help to make things a little unstable in places. The South Downs Way is a long distance footpath in Southern England and is one of Britain's National Trails. It runs for around 100 miles from Winchester in Hampshire to Eastbourne in Sussex, with a small loop around Eastbourne. The South Downs Way passes through the South Downs, a beautiful area which is now a National Park. The path mainly follows old routes and droveways along the Chalk escarpment. The majority of the path is a bridleway and so can be used by horse-riders and cyclists too.